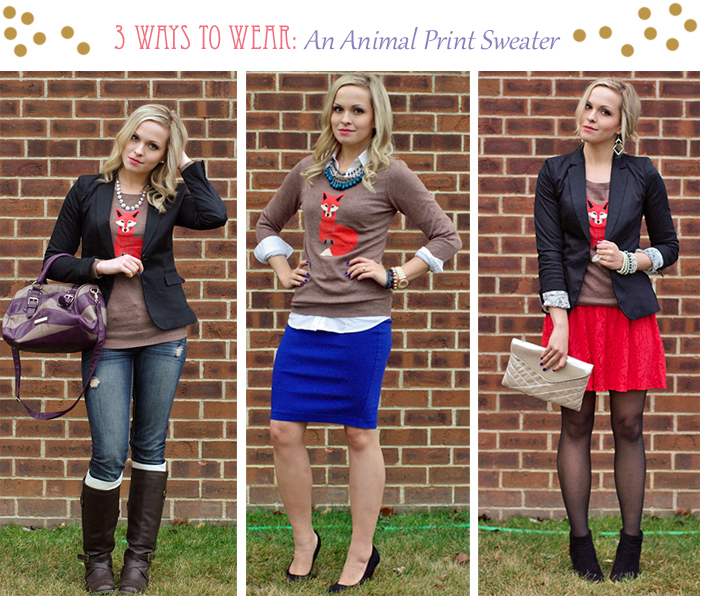 lynette marie: Three Ways to Wear an Animal Graphic Sweater! 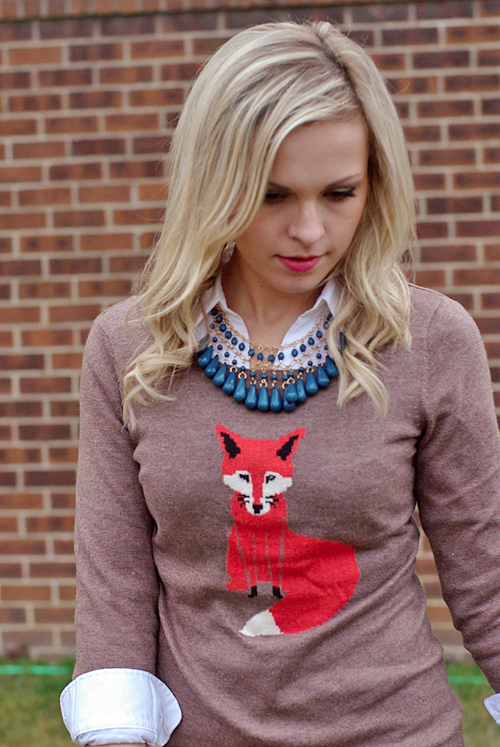 I've been seeing this darling fox sweater everywhere in the blogosphere, and it's been so sold out on Old Navy's site for FOREVER. I didn't even bother to stop by the store to see if they had any in stock until a couple of days ago, and lo and behold, they had an abundance! God bless you, Old Navy. And your little foxes, too. So, much like the blue skirt fiasco, I picked this item up because it was a trendy item (and only $15 in stores) without really thinking about how I could wear it. When I got it home, I thought, how else can you wear a sweater fit for a 6 year old other than with blue or black jeans or pants? I was on a quest to find out, lest I let this cute sweater sit in my closet all winter! FYI: this post is slightly photo heavy! The first and most obvious way to wear this sweater is casually. Just about anything fit for a six year old can be fit for a twenty-one year old if you add a blazer, skinny jeans and boots, right? I wore this outfit out running errands on a Sunday afternoon. The sweater is so cozy and warm, perfect for the surprisingly warm weather (as in 50 degrees) we were having that day. The next way I tried to style this was into a work appropriate outfit. I know that I might seriously asking for it by walking into an office of grown adults, wearing a fox sweater, but whatever. YOLO, right? I've worn this sweater to work once and haven't gotten any snide remarks yet.. I am rather proud of finding another way to wear this skirt though! Two trendy items in one outfit? Who you tryin' to impress, Lynette? Oh yeah. You guys. Do you like me? Check yes or no. And lastly, I dared to find a way to wear this sweater that was dressy, and possibly ready for a holiday party. Something I've never tried before was wearing a shirt over a dress to make it like a skirt, so I tried it out with this sweater, since the dress almost perfectly matches the fox! Dress: Target, forgot the price! I LOVE the fox sweater!! And I think you rocked all three looks. I have the French Hen sweater from J. Crew and wear it to work all the time - that little hen and I? We're tight. Love the idea of dressing it up though - haven't tried that yet! Thanks, Morgan! I've been drooling over the animal graphic sweaters from J. Crew, but Old Navy is much more my budget, haha. i cant decide whic i like the most!! nicely done!! Love it! You look great :) Animal prints are a must this season! These are really nice ideas, love them! I can't decide which one is my favorite- I love your style! I love love love that sweater! so whimsical! $15 at Old Navy, lady! I just love the First one and the third, so adorable! I really love your style, keep it up! So cute!! I love the look with the red dress, and I thought it was a skirt. Love the sweater! The dress is actually more like a tangerine color, but thanks! You seriously look amazing! I think the third with the skirt is my favorite; it's so unexpectedly perfect! I think it's sold out online, but I got mine in stores! They do run kind of big in my opinion. I picked up an XS and wouldn't have minded if it were a little smaller, so if you're smaller than me, it might be kind of big! To be honest, I'm not the biggest fan of that sweater but I love, love, love all the ways you've paired it. You've got such great style :D.
Lovely sweater and great outfits, especialy the second! Just happen to pass by your blog!! Very nice outfits!! Most of all i prefer the first!! :p If you want you can take a look on my blog! !I'm a new blogger !!!!! :) We can follow each other! !What do you think??? :) Just let me know your answer -where you follow me- on my blog and then i followed you back!!! Okay, so happy to have stumbled across your blog today. Could you be any cuter? Absolutely obsessed with this look! I'm totally in love with all three looks, especially the second one! I love that you did a post on animal sweaters because I always want to buy one but have no idea how I'd wear it. I love the second outfits top and the third outfits skirt! i love how you styled this! the first casual look is my fave. i just bought this exact sweater for my bff, took me 2 different old navy's til i found it! I found it right away, thankfully, but I see it EVERYWHERE in the "blogosphere", so I know why they're hard to come by! These are all adorable. I think the blazer one is my favorite because I could totally recreate it (if I had a fox sweater). I like the new updated blog too! So fresh and so clean. looooove all these options - you are one gorgeous lady!! :) THanks for stopping by my blog..! I'm hitting that follow button and following you! I have a giveaway running right now & would love for you to enter it! Animal print sweaters are so popular these days! I like how you styled yours three ways here, really cute. The Fox print is my fave. Love your blog and I love that sweater! You look darling in all three look! I came to check out your blog and this post popped up and I. Am. In. Love. You have such great style and I am so excited to get to keep up with it now! 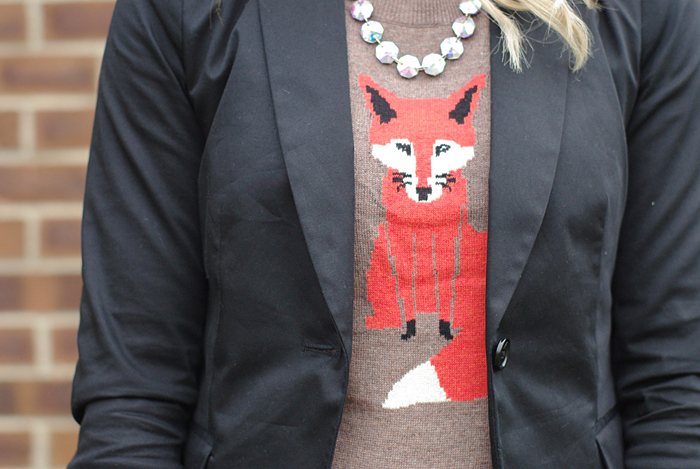 I was out of the country when this fox sweater was released (and completely sold out!) but I have a navy sweater with a red lobster from J Crew that is similar and I was struggling to figure out what to wear it with. Thanks for the ideas!!! !